Why do stories need to be linear and repeatable? What if instead of finishing a movie, you could keep exploring it? What if your favorite side-character could become central to the plot? Why can’t we harness technology to explore our creativity in a new hybrid of full-interactive, immersive animation? A new startup is determined to do just that. MashUp Machine seeks to bring the creativity and open-ended nature of traditional storytelling to the era of mass media. The idea is deceptively simple. The startup provides their users with a suite of tools to make it easy to create interactive stories, and a bit of machine learning code to help them explore ideas. In return, anyone can contribute to the infinite iterations of a constantly branching, evolving story. MashUp Machine is backed by industry veterans Ben Cole and Christopher Sjöholm. Cole is an Academy Award-winning developer, former North American Head of Software for one of the world’s largest visual effects studios, MPC. Sjöholm complements that with nearly 20 years as Creative Director for major video game franchises like FIFA, Prototype 2, and skate. The way we deal with stories now is “almost Darwinian,” Cole told Gizmodo. Creators make something, then throw it out into the world and hope it finds an audience. But the current way of producing stories doesn’t fit with how we consume stories. Yet our consumption is throttled by how many movies, games, books, or comics a creator can churn out in a year. We want to explore alternate endings, but we are trapped in a single static story. We want to change the stories we consume to reflect the lives we lead, swapping genders, racial identity, cultural background, and economic class—but we can’t. So why not crowdsource collections of evolving, branching stories exploring every possible idea? Enter Scary Cabin, a proof-of-concept for this new breed of storytelling. The setting is simple—a scary cabin in the woods, and a cast of likely characters. But what happens next is up to you, and a few thousand of your closest friends co-creating together. MashUp Machine embraced horror genre stereotypes in creating the cast, but those characters don’t need to behave like their archetypes. “Leave it to the audience to decide who these people really are,” said Cole. “Maybe the characters will have different personalities in different spaces.” Don’t like where the story is going? Branch it somewhere different, or start over. Instead of writing a bunch of comments, go in and change it to what you want it to be. The suite of tools also includes machine learning code for assisted storytelling. “It’s a fun, creative suggestion tool whispering over your shoulder,” Sjöholm told Gizmodo. “We want it to inspire you to create something unique.” When you’re feeling stumped, or just want a challenge, you can turn to the code for that little extra nudge. “Digital for me is a synonym for interactive,” said Cole. At it’s full potential, “It’s not a game, but a movie that adapts to fit your mood, your humor, and your attention.” If your attention drifts to a secondary character, the movie can focus on them and their story. MashUp Machine is aiming for a future where stories can adapt, learn, breed and evolve, and where the audience influences how their entertainment unfolds. And it’s a story format just begging for virtual reality. “Virtual reality takes some of the control away from the director, and into the hands of the audience,” Cole said. Even a simple head-turn throws out carefully-crafted camera angles and points of focus in favor of what the audience finds interesting. By mixing infinite branch points into the inherently immersive nature of virtual reality, MashUp Machine hopes to create a feedback loop between story creation and story consumption. The startup is embracing this with the ability to virtually go on set when using Google Cardboard, or by scrolling around the scene by rotating your smartphone. But this goes beyond a creepy cabin in the woods, or even teaming up with friends to tell stories together. This is a chance to open up storytelling so it stops being a static experience. Scary Cabin will keep getting richer, and MashUp Machine will become home to more original story worlds. Fan fiction is popular in part because it’s familiar, yet different. “You get to keep living inside a world, but experience something new,” said Cole. For the content creator, partnering with MashUp allows the stories to keep going as fans take on exploring and customizing what happens after the credits roll. 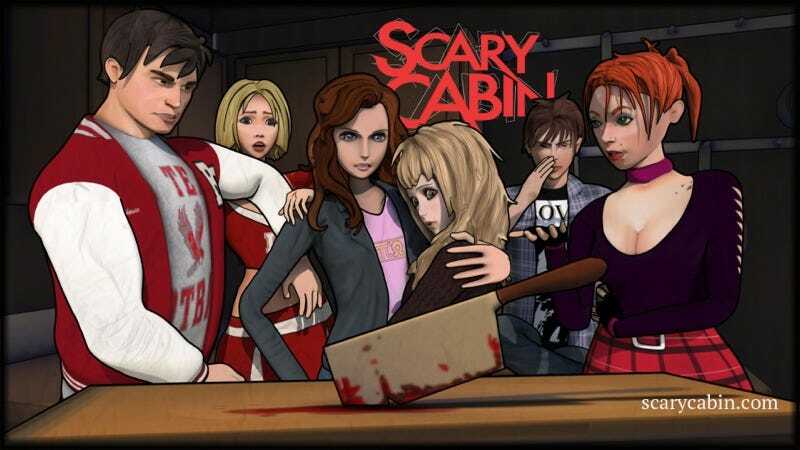 Right now Scary Cabin is in a slow-release beta. Sign up to join, and give feedback on the user interface as it evolves. Only a starter set of content creation tools are currently available, but more will be released as Cole, Sjöholm, and their team see how people are using them. Want to be even more involved? MashUp Machine is actively looking to talk to machine learning researchers, software developers, UI experts, and more. “We want to catalyze communities to create something bigger,” said Cole. Sign up for the beta here, and follow the latest updates at @storymashup. Have questions? Cole and Sjöholm will be swinging by the comments, so ask away!